Anyway. 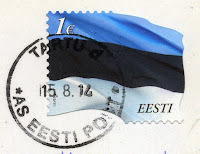 I'm starting today with this summery postcard from Estonia that mum and dad sent from their holiday last summer. I hope we'll get some warmer days here soon, too, I'd love to go out in a dress!